Meeks Steps Up Bigtime to Win In Dallas! 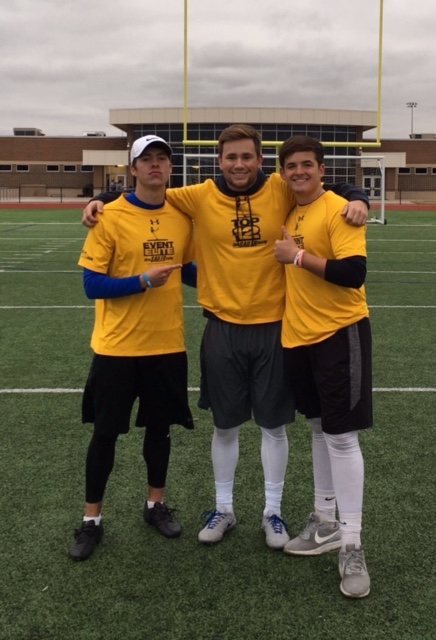 Chris Sailer Kicking hosted the largest camp of the fall to date, and it just might have also been the most talented, this past weekend in Dallas, TX. Specialists from over 10 states were in attendance to learn and compete. The camp could have been won by a dozen or so athletes, but only one could come out on top. Take a look at the results. 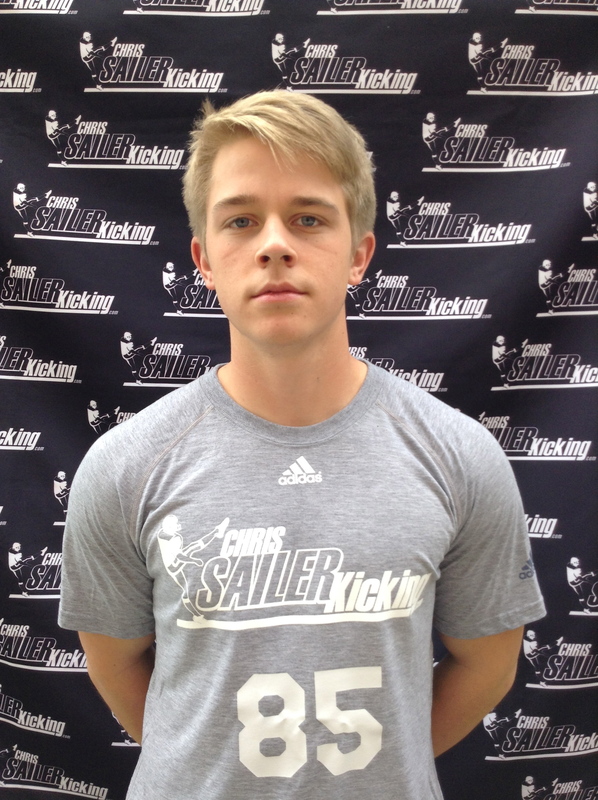 Jacob Meeks (2018, TX) – The longtime Chris Sailer Kicking student had his best performance ever. He won a major field goal competition by hitting on 7-7 field goals with a long of 57. His kickoffs were also strong. He averaged over 65 yards with 3.7+ hang time. Jacob is coming into his own at the right time. He has a bright college future with continued hard work. 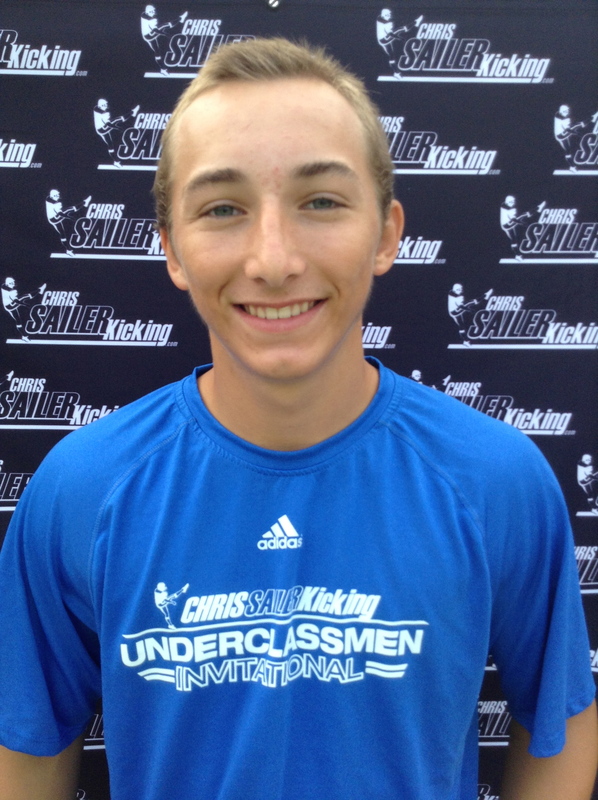 Matthew Jaeger (2018, MN) – Matthew is another longtime Chris Sailer Kicking student who is beginning to dominate camps. He won a major field goal competition by going 8-8 and connecting on back to back 58 yard field goals. He is smooth and accurate. His kickoffs are also nearing the top of his class. Matthew is gong to be a fine college player. 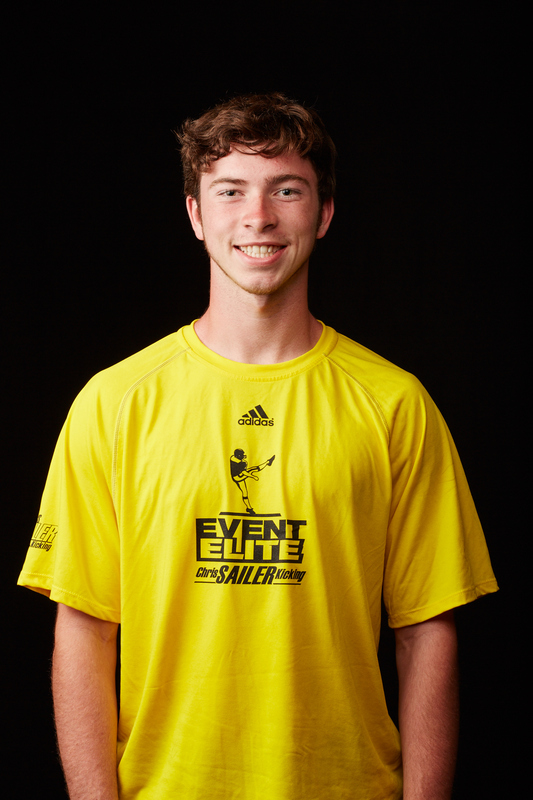 Liam Jones (2017, OK) – Liam was the most impressive all around specialist on the day. He connected on over 90% of his field goals and dominated mentally. He won the kickoff competition by hitting a few balls through the uprights. His best ball on the day was 75 yards with 4.13 hang time. The Kansas commit is 100% ready for the next level. 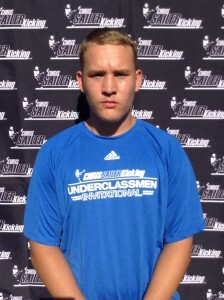 Jack Geiger (2017, CA) – Jack was by far the best punter on the day. 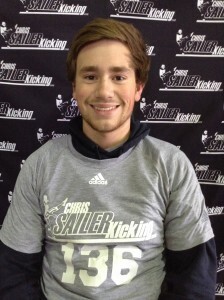 The Chris Sailer Kicking Event Elite specialist dominated in all punt competitions. He averaged 40+ yards with 4.3+ hang time. He was consistent and also showed the ability to hit a big ball. His best ball on the day traveled 55 yards with 4.88 hang time. Jack is a top national punting prospect. Josh Grant (2017, TX) – Josh continues to prove himself time and time again. He has 55+ yard range on field goals off the ground and gets excellent height on his ball. He also has a D1 kickoff leg. Josh is a competitor that does very well under pressure. He has all the tools to excel at the D1 level. Look for Josh to be one of the next national prospects to be offered a D1 Scholarship. Blake Mazza (2017, TX) – Blake is a tremendous kicker. He has one of the strongest legs in his class and kicks with great accuracy. His field goals and kickoffs are both D1 ready. Blake is also a great competitor that does a nice job under pressure. He is going to make a fine addition to any college football program. Chris Kessler (2018, TX) – Chris continues to prove time and time again that he is a top national prospect in his class. He is smooth and accurate on field goals with excellent range. He is also strong on kickoffs. Charles Campbell (2018, TN) – Charles is another strong contender for the top national prospect in his class. He is a great athlete with a elite leg strength. Charles is equally talented on field goal and kickoff. Cole Talley (2018, TX) – Cole has perhaps the strongest leg in his class. He is an incredible athlete with endless talent. He shows he can hit a big ball off the ground at times. His kickoffs are elite. With hard work, he will be a special D1 player. Cameron Dicker (2018, TX) – Cameron is another special prospect in the class of 2018. He has an exceptional leg and shows great overall potential. His field goals are strong and accurate. He is near the top of his class of kickoffs. He also shows he is a very capable punter. 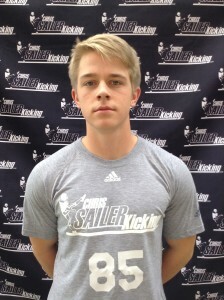 John Mayers (2018, TX) – John is a strong and accurate kicker. He hits a pure ball on field goals off the ground and has excellent range. His kickoffs are also near the top of his class. John is one of the most consistent performers in his class. 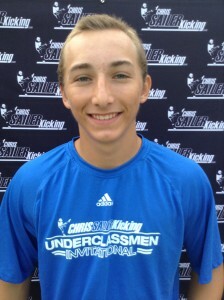 Alex Felkins (2018, OK) – The longtime Chris Sailer Kicking is beginning to dominate his class. He is big, tall, strong and athletic. Alex hits a pure ball off the ground already with excellent range. He is also near the top of his class on kickoffs. And he is coming into his own as a punter. Alex has a bright future. 2016 TX Summer Camp Recap, Josh Grant Dominates! The 2016 Chris Sailer Kicking Summer Tour has officially begun. 7 states, 9 camps, 14 camp days, 18 travel days, 800 + specialists, 6 U.S. Army All-Americans and countless flights up and coming. It is a great time of year. The first stop was Dallas, TX. Over 100 athletes from multiple states were in attendance to train and compete. Take a look at the results. Josh Grant (2017) – The “TOP 12” Member and long time Chris Sailer Kicking student absolutely dominated from start to finish. He won the field goal competition by nailing a 65 yarder. He also won the kickoff competition by hitting an 80 yard kickoff. Josh is physically and mentally ready for D1 football. OFFER NOW!!! Kevin Madigan (2017) – Kevin had a phenomenal day. He made over 90% of his kicks and showed range well beyond 50 yards. He charted out the best on the day and then won a head to head finals match to become champion. Kevin is a great player that is going to make a fine addition to a college football program. 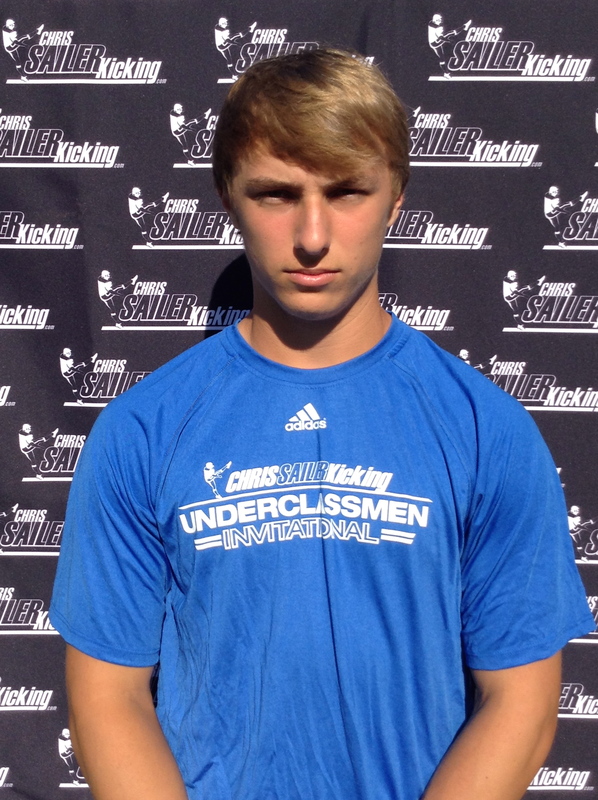 Drew MacKay (2017) – Drew is a very talented all around Kicker / Punter. He showed he could hit a nice ball off the ground. His kickoffs were amongst the elite at this camp. And he came out on top of the punt competition. Drew is a well rounded athlete that will be able to contribute in many ways at the next level. Blake Mazza – The “Event Elite” Member was stellar once again. He is smooth and consistent on field goals. He has excellent range. His kickoffs are near the top of his class and D1 ready. Hit several balls over 75 yards on this day. Blake is a D1 Kicker without a doubt. John Mayers – John is an excellent kicker. He is strong and very smooth. Field goals and kickoffs are both near the top of his class. Expect big things from John the next 2 years. Brayden Narveson – Brayden was the breakout player of the camp. He is a talented athlete with a big time leg. He showed off his ability by hitting a 58 yard field goal off the ground. There is great potential here. Look for Brayden to compete with the best of the best. Carson Garrett – Carson is a great young talent. He won the head to head field goal competition for those in the Class of 2019 and younger. He connected multiple times from 50 plus yards off the ground. He is also very strong on kickoffs. Big things ahead for Carson! 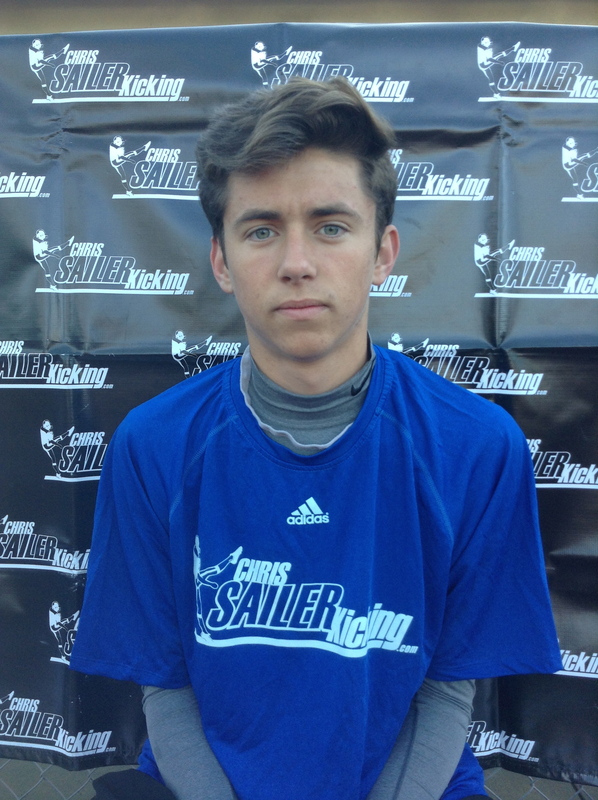 For more information including full player rankings and future camps, visit www.ChrisSailerKicking.com The full 2016 Chris Sailer Kicking Fall Camp Schedule is now available. 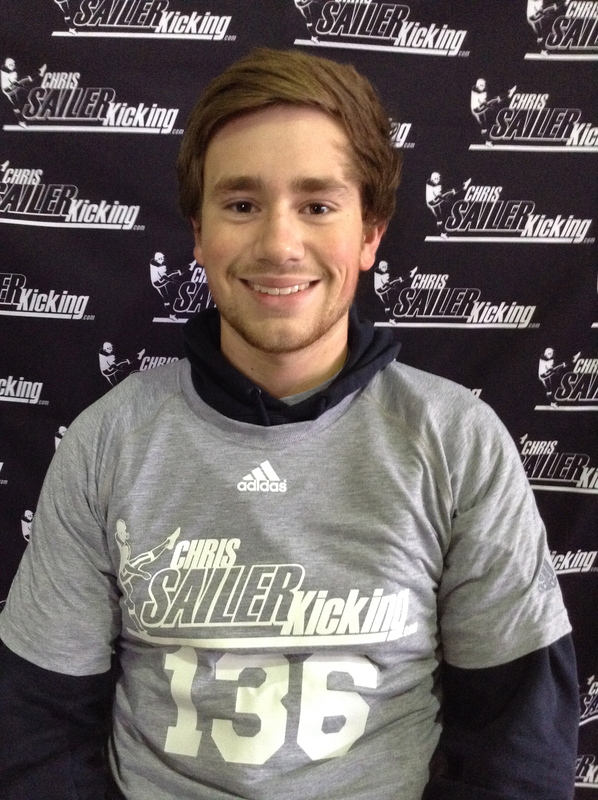 Chris Sailer Kicking will next visit Chicago, IL (7/9), Charlotte, NC (7/11), Atlanta, GA (7/12) and Los Angeles, CA (7/31). Other huge camps coming up…. FBU Top Gun (July 14-15 in Rock Hill, SC) This is where we will select the U.S. Army All-Americans, 9th Grade All-Americans, 8th Grade All-Americans & 7th Grade All Americans. In 2003, Chris Sailer Kicking established the biggest kicking, punting, and long snapping camp the world had ever seen, The National Kicking Competition. The camp brought in the best of the best from across the nation to compete at one location. The camp established credible recruiting rankings and evaluations for kickers, punters, and long snappers that college coaches across the country would use for years to come. The camp, now simply known as VEGAS takes place in Las Vegas each year in January. Every athlete comes with one major goal in common, making the prestigious “TOP 12”. This is THE exposure list to be on for national exposure. The twelve best underclassmen in the nation are identified for the Kicking/Punting positions. The best of the best are then invited to the exclusive, invite only,“TOP 12” camp that following summer. College coaches take notice, and scholarships are awarded. To get an idea for what the “TOP 12” is all about, take a look at some of the very best over the years: Ryan Succop (South Carolina & Tennessee Titans), Kai Forbath (UCLA, Lou Groza Award Winner, & New Orleans Saints), Dan Bailey (Oklahoma State, Lou Groza Award Winner & Dallas Cowboys), & Randy Bullock (Texas A&M, Lou Groza Award Winner, & New York Jets), Bryan Anger (CAL & Jacksonville Jaguars), Brad Nortman (Wisconsin & Carolina Panthers), Blair Walsh (Georgia & Minnesota Vikings), Justin Tucker (Texas, Baltimore Ravens & Super Bowl Champion), Jeff Locke (UCLA & Minnesota Vikings), Cody Parkey (Auburn, Philadelphia Eagles), Tress Way (Oklahoma & Washington Redskins), Ka’imi Fairbairn (UCLA, Lou Groza Award Winner & Houston Texans). Just to name a few! Meet the “TOP 12″ Class of 2017! 3 Biggest Role Models: Robert Cassidy, my great grandfather (passed in 2015), Zackery Cimaglia, my brother & my dad Dan Cimaglia. Family is very important to me. Want to be a part of it? 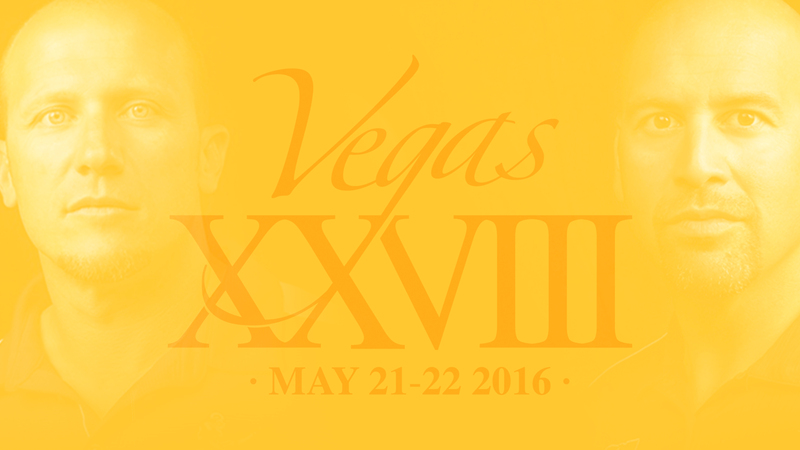 Your chance comes May 21-12 at VEGAS XXVIII. Do you have what it takes to make “Event Elite”? 2016 TX Spring Camp, Freshman Will Reichard Wins It! The 2016 Chris Sailer Kicking Spring Camp Tour got off to a great start in Dallas, TX this past weekend. Well over 100 athletes from 10 plus states were in attendance. The camp featured long time Chris Sailer Kicking kicker and staff member Nick Folk of the New York Jets. He gave a fantastic demonstration and stood in on all the meetings offering priceless advice. The mixture of outstanding veterans and talented newcomers at the camp made for excellent competition. Take a look at the results. 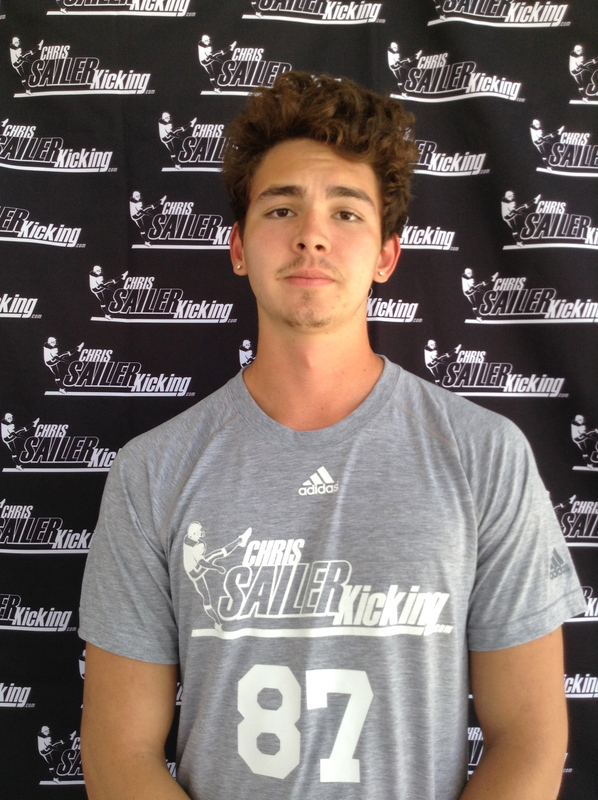 The long time Chris Sailer Kicking student came through with a breakthrough performance. The #1 kicker in the nation in the Class of 2019 proved why in a major way. He is the first freshman to win a regional camp in many years. He hit multiple 50 plus yard field goals and his kickoffs were all 65 plus yards with 3.8 plus hang time. He is an extraordinary talent. One of the very best that I have seen at this age since Cody Parkey, now of the Philadelphia Eagles. Austin put in an impressive performance in Dallas. He was also a standout last month in Las Vegas. Austin is proving he is a top national prospect in the Class of 2017. He hits a pure ball off the ground and shows 55+ yard range. His kickoffs are also competitive with the very best. Look for Austin to gain the attention of major college coaches around the nation this off season. 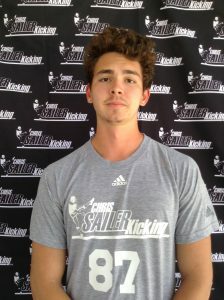 Another long time Chris Sailer Kicking student was dominant on kickoffs all day. He won the competition by hitting a 76 yard, 4.08 hang time kickoff. He has really come into his own and is ready to move on to the college level. He has the talent to compete at any level. This was Bernardo’s first camp with us, but he stepped up when it counted the most. He consistently hit 40 plus yard punts, with 4.4 plus yard hang time. He is a talented athlete that shows the ability to compete with the top punters in his class. Keep a close eye on him this spring and summer. 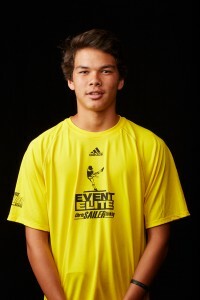 John Dellagarza (TX) – John is a talented punting prospect. He has the size and skill set to compete at the D1 level. 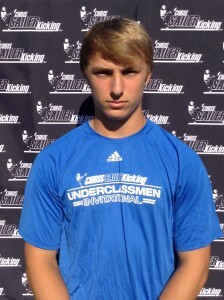 Grant Perkins (TX) – Grant is a strong legged kicker that has excellent potential. His field goals and kickoffs both show great promise. 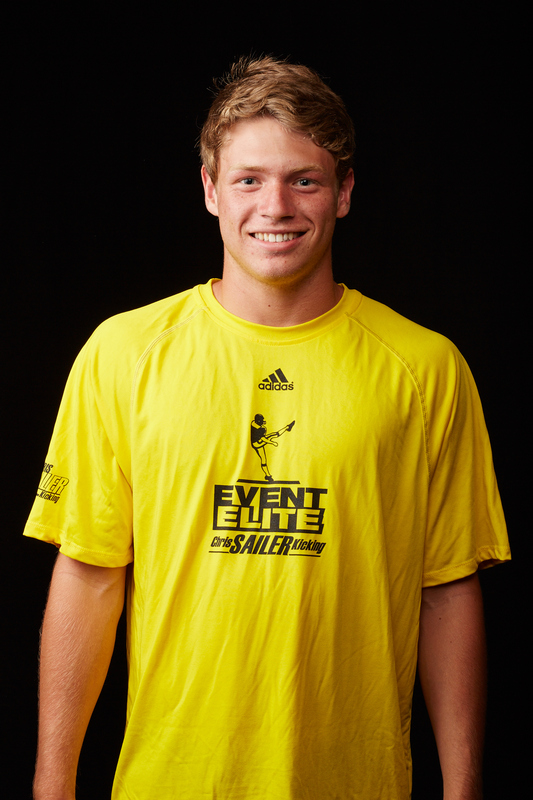 Liam Jones (OK) – Liam is a great kicking prospect. He is smooth and accurate on field goals. His kickoffs are strong. He has a bright college future. Josh Grant (TX) – Josh is one of the best kickers in the nation. He gets excellent height on his field goals off the ground. His kickoffs are near the top of his class. Blake Mazza (TX) – Blake is an excellent talent. He hits a great ball off the ground on field goals. His kickoffs are also a strong point. Nick Horiates (TX) – The long time Chris Sailer Kicking student had his best day yet. He was dominant at times on both field goals and kickoffs. Tons of talent here. Also keep an eye on: Kevin Madigan, Eric Carrasco, Turner Davidson, Miguel Aponte, Michael Ewton, Tristan Perry. Cole Talley (TX) – Cole has one of the strongest legs in his class. He shows flashes of dominance on both field goals and kickoffs. A great athlete with a bright future. 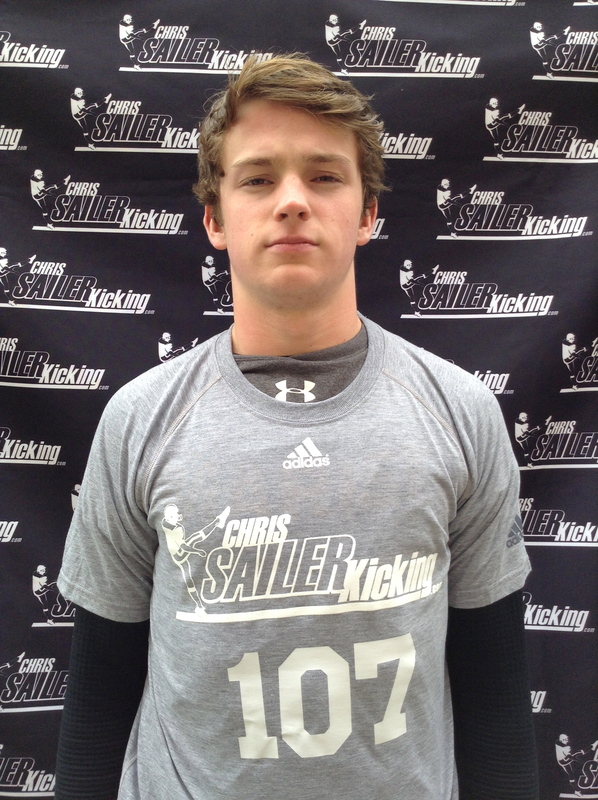 John Mayers (TX) – John had an impressive camp. He has a big time leg and shows he can hit an excellent ball off the ground. Kickoffs are also strong. 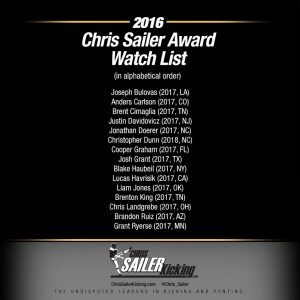 Also keep an eye on: Christopher Freibert, Jim Hayden, Matthew Martin, Jacob Meeks, Evan Price, Ryan Scott, Jake Smith, Hayden Nelson, Nick O’Shea. 2019 Future Stars: Alex Felkins, Neal Koskay, Josh Plaster, Luis Reyna, Austin Rychlik, Tyler Shearer, Logan Shields. Youth Prospects: Tabor Allen, James Griffith, Preston Johnson. 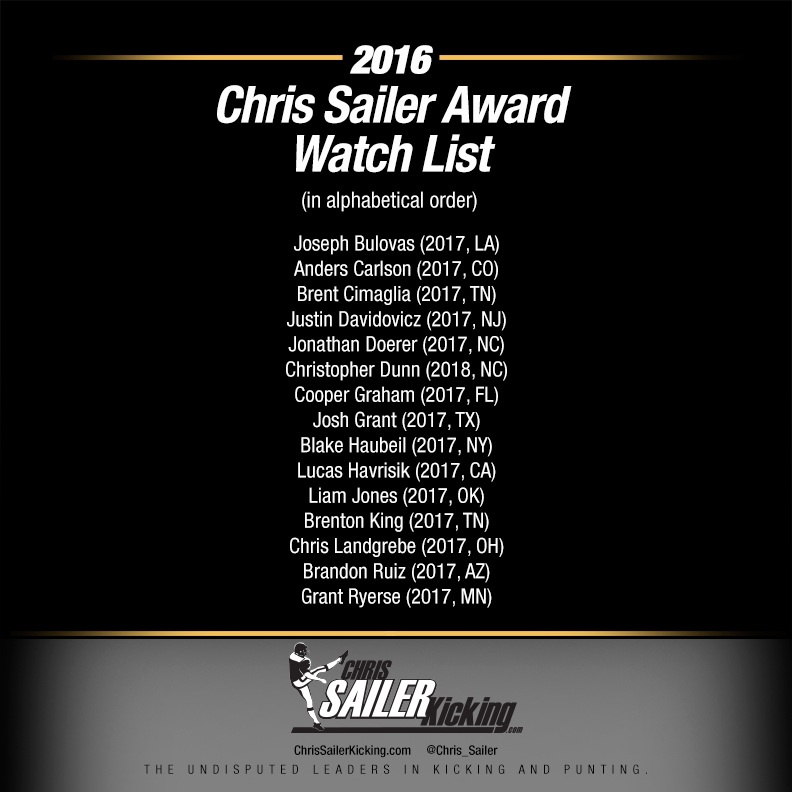 For full rankings and more information, visit www.ChrisSailerKicking.com Chris Sailer Kicking will next make stops in Los Angeles, CA (March 6), Atlanta, GA (March 12), Charlotte, NC (March 13), Chicago, IL (April 2), Seattle, WA (April 24), Miami, FL (May 7), New Jersey (May 7), Dallas, TX (May 15), Los Angeles, CA (May 15) and Atlanta, GA (May 15). The spring will culminate with the largest national specialist camp in the world, Vegas XXVIII (May 21-22). Joseph Bulovas Dominates Texas Fall Camp! The Chris Sailer Kicking Fall Camp Tour concluded with a huge camp in Dallas, TX on Sunday, December 13th. Nearly 200 specialists from all over the nation attended to compete and prepare for the upcoming Vegas Event in January. There was a great mix of young and upcoming talent such as Cael Lundin, Brody Patty and Brian Barber to seasoned veterans like Bailey Raborn (LSU Commit), Butch Hampton (Western Michigan Commit) and Luke Hogan (Brown Offer). Take a look at the results. Overall Camp Champion: Joseph Bulovas (2017, LA) – Joseph is a longtime Chris Sailer Kicking studenty that absolutely stepped up on this day. He won the kickoff competition as well as a major field goal competition. He is a tremendous athlete with one of the strongest legs in the nation in his class. He shows easy 55+ yard range off the ground on field goals. He put many kickoffs through the uprights. Joseph is a great competitor that does his best under pressure. He is a sure fire scholarship pick. Offer Now!!! 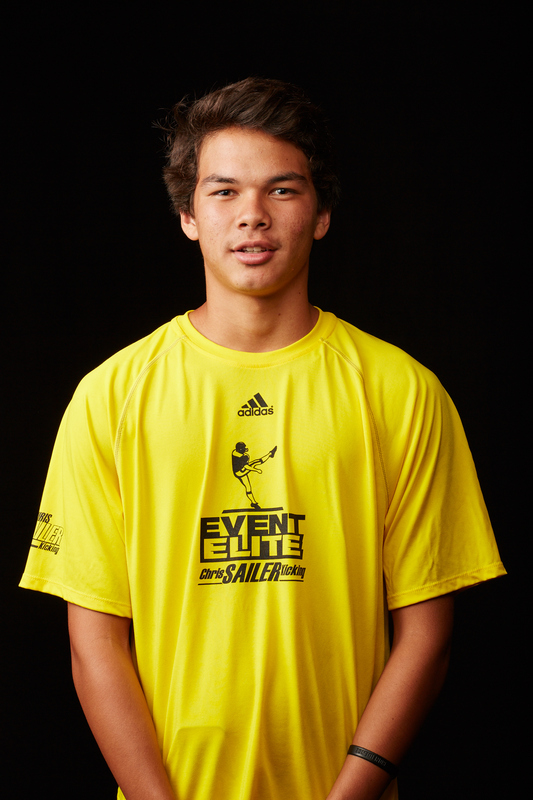 Field Goal Champion: Cole Gibson (2016, VA) – Cole has an impressive camp from start to finish. He is big, tall, strong and athletic. He hits an excellent college level ball off the ground on field goals. His kickoffs are also ready for the D1 level. Look for Cole to turn heads as we head into Vegas XXVII. He is a D1 kicker without a doubt. Punt Champion – Oscar Draguicevich (2016, TX) – Oscar had an excellent day punting. He is a good athlete that punts with nice consistency. Oscar punts for outstanding hang time and distance. He averaged over 40 yards per punt, with 4.4 plus hang time. He also shows the ability to hit a big ball. He has a bright college future. Top 2016 Prospects: Bailey Raborn, Butch Hampton, Jake Oldroyd, Luke Hogan, Blake Patterson, Alvin Kenworthy, Grant Perkins, John Hilfer, Will Moore, Caleb Chadwell, Colby Lorenz, Daniel Esparza, Gavin Capehart, John Wengierski, Nolan Harvill, Edwin Noyes. Top 2017 Prospects: Josh Grant, Jovi Munoz, Briggs Bourgeois, Forrest Diaz, Gabe Pontiff, Geoffrey Pace, Grant McCartney, Johan Zetterberg, Karim Darwiche, Kevin Madigan, Luis Reyes, Marco Salani, Michael Ewton, Nick Horiates, Peyton Henry, Ryan Harwell, Tony Decozio, Seth Green, Tristan Perry, Taylor Cornish, Liam Bunnell. Top 2018 Prospects: Cole Talley, Chris Kessler, Austin Guidry, Kaeden Roberts, Karch Kaspar, Grant Braught, Hayden Nelson, Jim Hayden, Jacob Meeks, Jake Smith, Savana Melton. Top 2019 Prospects: Alex Felkins, Brian Barber, Brody Patty, Kyle Gifford, Wesley McHugh, Austin Rychlik. 2020 Future Star: Victor Garza. 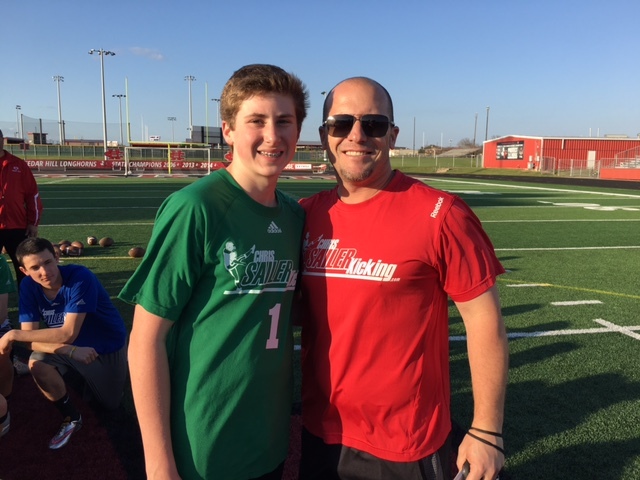 2022 Future Star: Cael Lundin – Named FBU Youth All-American post event by Chris Sailer. The 2015 Chris Sailer Kicking Fall Camp Tour is now complete. The world is now preparing for Vegas XXVII. Hundreds of specialists will converge in Las Vegas to train and compete at the largest kicking, punting and long snapping camp in the world on January 15-17, 2016. In preparation there will be 2 camps on January 9th (Los Angeles, CA & Atlanta, GA). 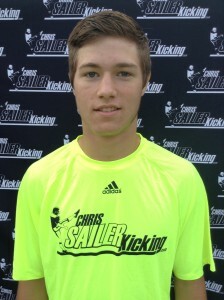 Visit www.ChrisSailerKicking.com for more information and to register for all camps. Joseph Bulovas should challenge for a “TOP 12” Spot this coming January in Las Vegas! TX Summer Camp Recap – Ewton Comes Out On Top! 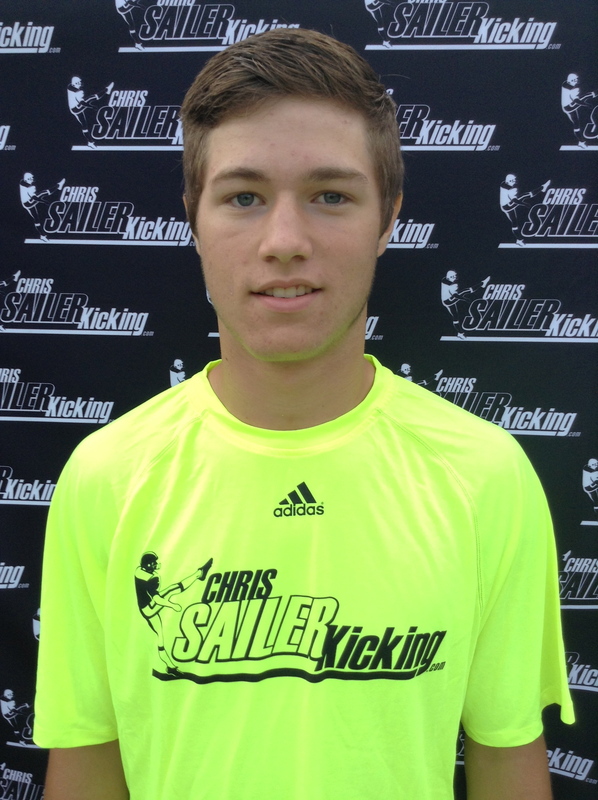 The Chris Sailer Kicking Summer Tour rolled on with a stop in Dallas, TX on July 23. Always a hot bed for talent, specialists once again did not disappoint at this very popular camp. Well over 100 athletes representing over a dozen states and 2 countries were in attendance. Instruction, recruiting seminars, competition and evaluation were once again the name of the game. Take a look at the results. Michael Ewton (2017, TX) – Michael stepped up big time. He is one of the best pure field goal kickers in the Class of 2017. He rarely misses and showed range well beyond 50 yards. Michael hits a true ball off the ground. His kickoffs are also solid and show promise. A great competitor that will stay near the top of this class the next few years. 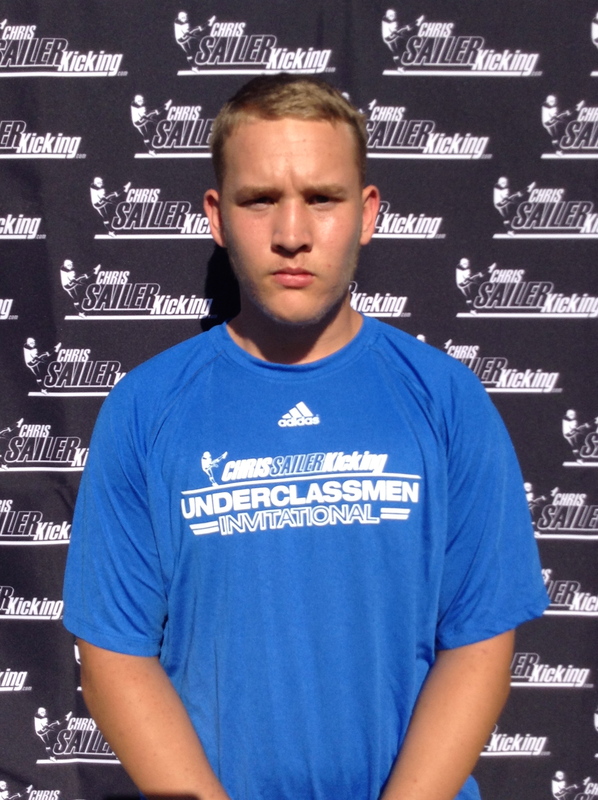 Joe Brookhart (2016, CO) – Joe is a gifted kicker / punter. He is a great looking athlete with a strong leg. He has nice natural talent. Joe hit a 60-yard field goal to win this competition. His kickoffs are also college ready. Plus he shows talent and potential as a punter. He has the tools to be a great college player. 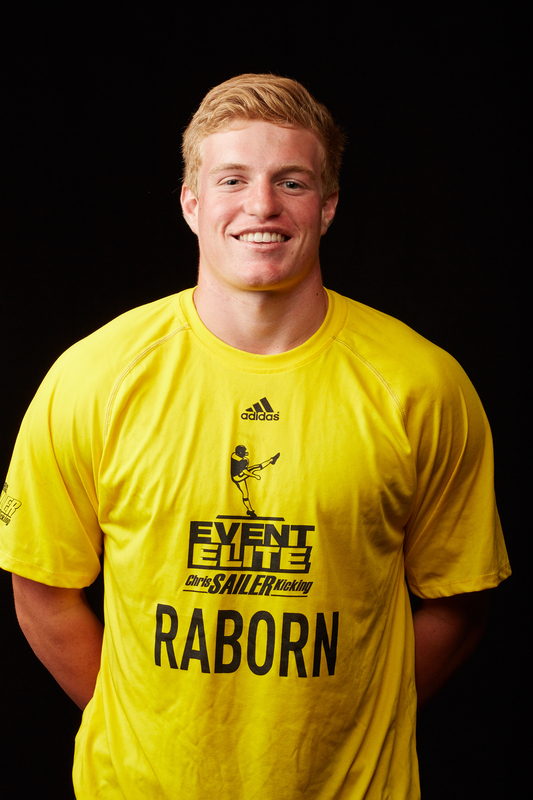 Bailey Raborn (2016, LA) – Bailey is one of the very best, if not the best combo player in the nation. The UCLA commit is a special talent. On this day he hit a 87 yard kickoff with 4.00 hang time. He also hit another kickoff off the upright from the 35 yard line. His field goals are strong. And his best skill just might be his punting. The versatile athlete will be a great player for the Bruins. John Delagarza (2016, TX) – John is a great talent. He is big, tall, strong and athletic. He has the ideal frame for a D1-Punter. He easily hits 45 yard punts with over 4.5 second hang time. He shows that he can hit 60 yard punts with 4.9 second hang time. His potential us fantastic. As he becomes more consistent, the sky is the limit. Could be a huge sleeper in this class. Blake Patterson (TX) – This lefty has big time potential. He has 55 plus yard range on field goals. He shows that he can hit kickoffs 75 yards with 4.15 hang time. And he has the ability to develop into a punter as well. Blake is a D1 prospect without a doubt. Other Class of 2016 Standouts: Aidan Daily, Cole Moos, Gabriel Rui, Alex Webb, Colby Lorenz, Landen Saling, Ryan Travis, Reece Morrison, Phillip Keys, Hayden Ashley, Caleb Chadwell, Zach Bryant. 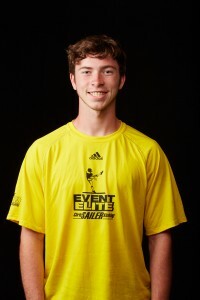 Hayden Moehring (AR) – Hayden is quickly vaulting himself into the national spotlight. The long time Chris Sailer Kicking student had a huge day. The now 5-Star rated kicker hits a big ball off the ground. Field goals are outstanding. Kickoffs are in the top 5 in the country in this class. He hit several balls over 75 yards with 4.0 second hang time. Hayden is a future star at the college level. Other Class of 2017 Standouts: Kevin Madigan, Josh Grant, Austin Neuhauser, Eric Carrasco, Gabe Pontiff, Geoffrey Pace, Liam Denholm, Luis Diaz, Luis Reyes, Robert Blue. Cole Talley (TX) – Cole can potentially be the #1 ranked kicker in this class for years to come. A great athlete with an incredible leg. He nearly beat out all the seniors on kickoffs. His best ball was 73 yards with 4.15 second hang time. Also has outstanding range on field goals. With hard work, he could be special. 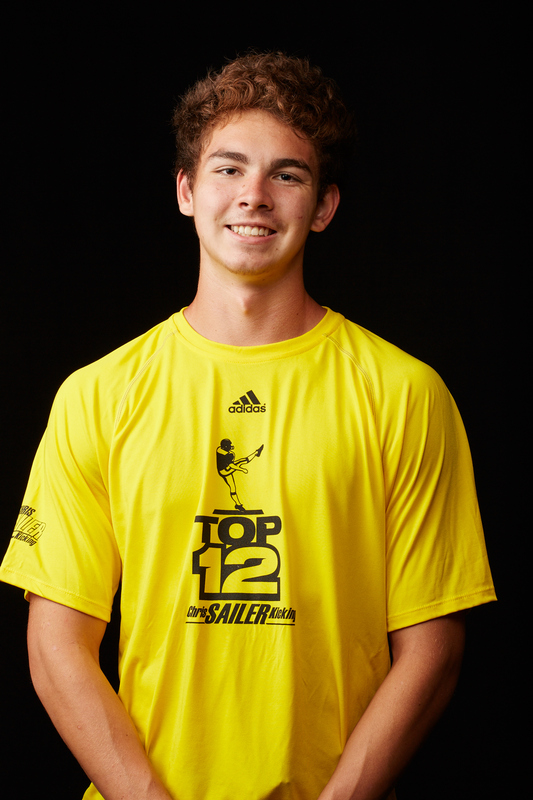 Will Reichard (AL) – The long time Chris Sailer Kicking student is starting to come into his own. He has always had great form and kicked with excellent consistency, but now the power is there as well. He hit field goals from 50, 52 and 54 yards. His kickoffs were also outstanding for his age. He is a great competitor who does very well under pressure. Look for Will to be a top kicker in this class for years to come. 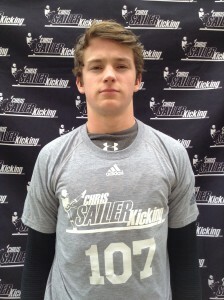 Chris Sailer Kicking will next make a stops in Charlotte, NC (July 25), Atlanta, GA (July 26) and Los Angeles, CA (July 29). 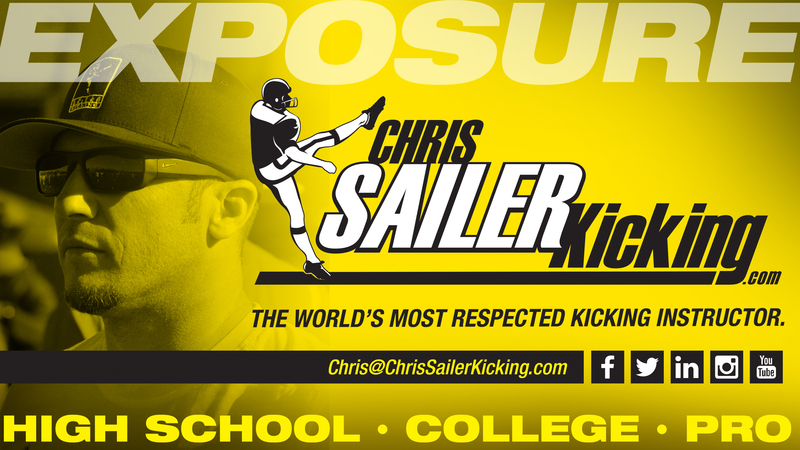 For more statistics, evaluations, rankings and future camp dates visit ChrisSailerKicking.com or contact Chris Sailer 818-209-8921 (text) or Chris@ChrisSailerKicking.com (Email). Bailey Raborn, UCLA commit, #1 Combo Prospect in the nation.